Book Karioca for your EVENT! 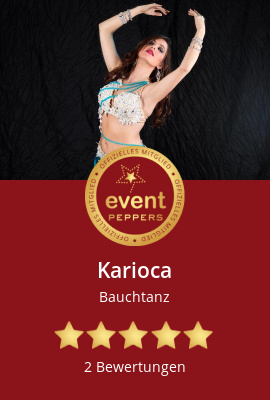 Karioca is an international oriental dancer based in Cologne (GERMANY), originally from Granada (Spain). Karioca is always searching for new ideas and inspirations. Her main teacher and instructor is Momo Kadous but she travels very often to enrich her dance and knowledge. Teacher, performer and organizer of dance and music events, Karioca has performed and taught all over europe. Karioca- an amazing women, bellydancer and teacher! She is do-er with a lot of passion that drives her. Karioca is dancing through live and at the same time always hard working. A soul that is on fire and a source of inspiration. When Karioca dances she can take you away in to another world..
And she is not only an amazing dancer but also the best teacher i could imagine! Patient and creative she teaches us the love to oriental dance and music! Thank you so much for everything! I feel very comfortable in front of the camera, so if you have an interesting and artistic idea and you see me on it, just contact me! My passion for music goes beyond dancing and I need to express it in all possible ways. That is why after leaving the music conservatory I started with the drums and the Egyptian tabla or darbuka. I studied computer science and even though I dedicate myself to dance, I also deisgn my own websites and Event pages. A dancer is usually also an intelligent mind!